The 3D printed model of Tinkleball© is a valuable learning tool that enables a child with vision impairment to get tactually familiar with Tinkeball©, one of the main characters in the Ballyland game apps. 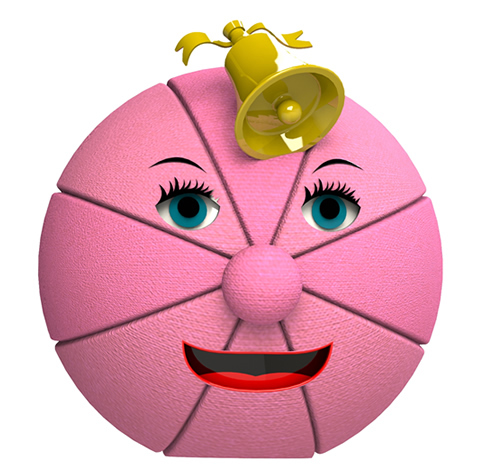 The 3D printed model of Tinkleball includes a bell on her head. There is an option to attach a small bell (not included) that can make a ringing sound to the loop behind the printed bell. Note that this is your own responsibility and liability: supervise a small child to avoid any choking hazard. Sonokids can't be held responsible or liable for any problems or accidents arising from a bell you choose to attach. All copyright of the 3D print model of Tinkleball© remains with Sonokids®. Sonokids provides with you a free license that allows you to print the 3D model, or to have it printed by a third party, under the strict condition that you don’t resell the file, or resell the printed model. By downloading and printing the .stl print file of Tinkleball, you confirm that you have read the disclaimer and that you agree to the conditions as set out above. If you want you can hand paint some of Tinkleball's features. Use child safe, waterbased paint. You can also choose to leave the model unpainted! Its tactile features will still be as recognizable and valuable as ever.